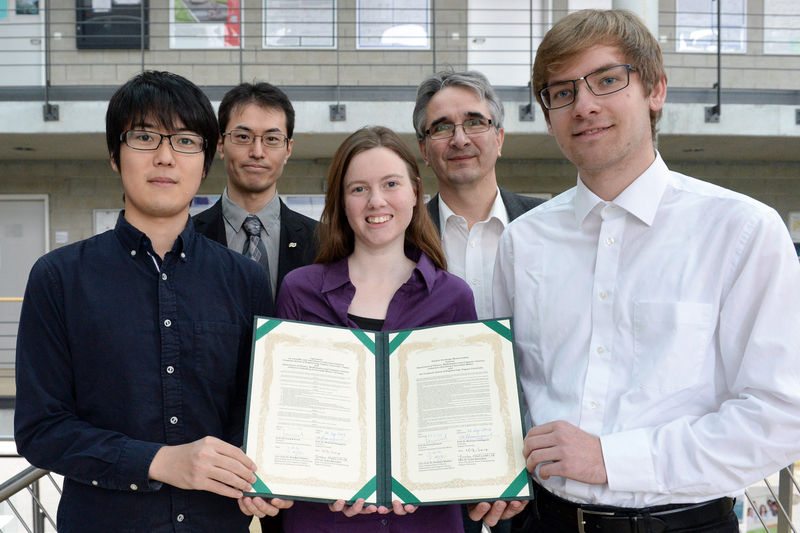 Two physics teaching degree students from Mainz will travel to Japan next year to study at the eminent School of Engineering of Nagoya University. This exchange has been made possible thanks to a cooperation agreement finalized between Johannes Gutenberg University Mainz (JGU) and the Japanese partner institution. In addition to the exchange of students and teaching staff, the agreement also relates to cooperation in the area of research, thus providing a formal basis for the already long-standing cooperation between the two universities in the field of theoretical physics. Nagoya University was in the headlines recently when the Nobel Prize in Physics was awarded to three Japanese scientists, including Hiroshi Amano, professor at Nagoya University, and Isamu Akasaki, professor emeritus there. The primary objective of the cooperation is to increase mobility and scientific Exchange. This is already being put into effect with the long-term scientific stay at JGU's Institute of Physics of Associate Professor Hideki Tomita and his Master's degree student Takahide Takamatsu, both from Nagoya University. "The exchange program will now allow our students to gain experience abroad – not merely in Europe but at one of the foremost educational institutions in natural sciences, the School of Engineering of Nagoya University in Japan, members of which have received four Nobel prizes in physics and two in chemistry over the past few years. This is an absolutely wonderful development and it is notable that two teaching degree students will be the first to take advantage in the initial round of the program," explained Professor Klaus Wendt of the Institute of Physics at Mainz University, who helped pave the way for the agreement. Vincent Degner is studying mathematics and physics and is currently in the final semester of his Bachelor's degree program at JGU. He will be spending a year in Japan starting in 2015. "I am particularly looking forward to experiencing the unfamiliar and exotic aspects of Japan," said Degner. In order to prepare, he has already attended Japanese language courses at evening classes and at Mainz University. What appeals to him especially is that he will not only be able to explore the language and culture of the Asian country but that he will also gain new insights into physics and education. He will attend lectures held in English at Nagoya University, which predominantly will be accredited toward his degree when he returns. Daniela Seibert, a physics and chemistry student in her sixth semester, has long been interested in Japanese culture and language and can now use the opportunity to visit the country for half a year. After taking language courses at Johannes Gutenberg University Mainz, she hopes to further improve her linguistic skills in Japan. "I also hope that I will learn a lot from living in a foreign culture. I am curious about what teaching and researching in another country is actually like," she added.